Professor Jaspars was educated in Cambridge UK; Dublin, Eire and studied with Prof Phil Crews at the University of California Santa Cruz where he co-authored the textbook ‘Organic Structure Analysis’. His group focuses on the functions and applications of marine natural products. The goal of the work is to determine their biological role as well as using them as pharmaceuticals and tools for biomedical research. In 2010 Marcel founded the Marine Biodiscovery Centre, a €3.1M investment focusing on marine bioresources for novel pharmaceuticals, and to investigate fundamental questions in chemical ecology and biosynthesis. Marcel leads the PharmaSea EU FP7 consortium which aims to make the use of marine microbial derived compounds a more attractive proposition to the pharmaceutical industry. The microbes are obtained from extreme environments, in particular hadal trenches, cryogenic environments and thermal vents. In 2015 Prof Jaspars was elected to the Fellowship of the Royal Society of Edinburgh. 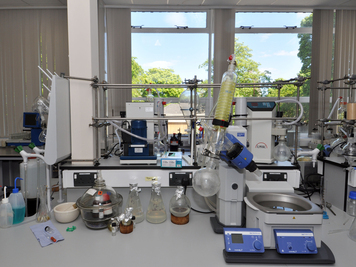 The Marine Biodiscovery Centre is part of the Department of Chemistry at the University of Aberdeen was founded in 2010, and is a €3.1 M investment to focus on marine resources for novel pharmaceuticals, and to investigate fundamental questions in chemical ecology and biosynthesis. The Centre contains facilities for chemistry, chromatography, spectroscopy, molecular genetics and microbiology. Competences at the Marine Biodiscovery Centre are the growth of microorganisms, extraction/isolation techniques, organic structure analysis using spectroscopic methods and the manipulation of biosynthetic pathways. The natural product chemistry competences are the isolation of pure compounds from complex mixtures, the determination of their plane structure using spectroscopic (NMR and MS) techniques and the elucidation of 3D stereostructure and conformational properties using degradative, derivatisation and combinations of spectroscopic and computational methods.